Supporting our customers with extensive and deep inventories is a primary mission for Pioneer. If you provide service in the automotive industry, build or maintain trailers and the equipment on them, provide solutions for your customers agriculture equipment wheel needs, or help your fleet customers service their truck and trailer wheels, Pioneer has the products you need. Whether it's managing inventories for our customers at their place of business, or providing just in time inventories from ours, Pioneer receives high marks from our customers. Our philosophy is to provide equivalent breadth of inventory in all of our branch locations to ensure high levels of coverage regardless of serving location. Customers take advantage of the availability of the best brands in the business plus value line options in many categories, regardless of the market segment they work in. All this is made possible by our commitment to the highest level of service possible, backed by Pioneers 95+ years in business. 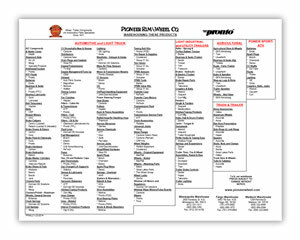 Click here to view our latest vendor line card. Contact Pioneer to get the full details.